In 1897, when Karl Elsener created the Victorinox, Original Swiss Army Knife, he could never have guessed how it would become a worldwide icon for function and durability, and the symbol for Swiss ingenuity. This unique ingenuity - which has inspired all of Victorinox Swiss Army products - comes from a dedication to listening, hearing and evolving designs to reflect the multi-faceted lives and values of our consumers. The SwissChamp pocket knife is the ultimate in functionality and utility. Incredible that this product features 80 functions and can actually fit into a pocket. The SwissChamp can do it. The ultimate in Swiss Army Knives, the Victorinox Swiss Army SwissChamp XAVT is large and in charge with 80 essential functions packed into one tool. In addition to assorted knives, scissors, screwdrivers you expect from a Swiss Army knife, the SwissChamp XAVT also includes a digital clock, altimeter, barometer, and thermometer. It's completed by a translucent red grip. 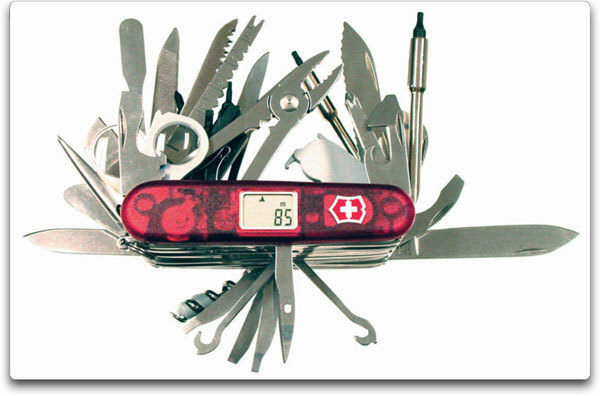 Everything you need from one Swiss Army knife.